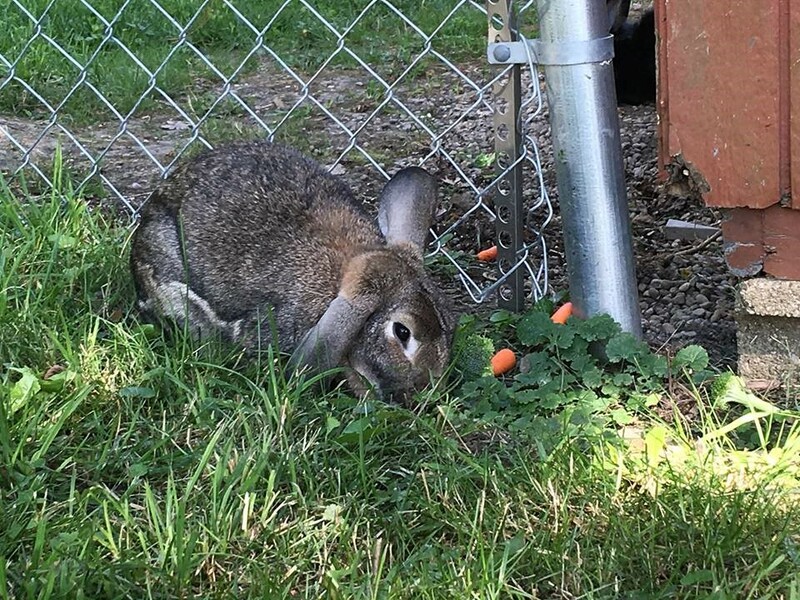 Ohio House Rabbit Rescue is frequently contacted by Good Samaritans about rabbits found outdoors in their yard, neighborhood, etc. The first thing to do is figure out if the rabbit is wild or domestic. If the rabbit does not look like the picture below, then it is a domestic rabbit. If you’re still unsure, check out this helpful article on Wild Bunnies vs. Pet Bunnies from Small Pet Select. If you need help with a wild rabbit that may be injured or in danger, please contact the Ohio Wildlife Center. Chances are that your local rescue is entirely volunteer based and may not be able to get someone out to the site immediately. This is where you can help! At the very least, leave some water and food in the area where you saw the rabbit to keep them in that general location for whenever volunteers are able to make it out to the site. Green leaf or romaine lettuce along with a few baby carrots or slices of banana should keep the rabbit coming back. If possible, try and refresh the food and water on a daily basis. Rabbits are creatures of habit and will keep a daily routine as long as food and water are available to them along their route. 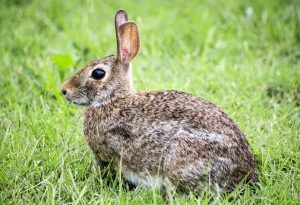 If you’re able and willing to try and catch the rabbit yourself, then the best time to attempt a rescue is early morning or late evening when rabbits are generally most active. If you do not see the rabbit, try looking under porches, cars, etc. as they tend to hide and rest most of the day. Some rabbits, if they were socialized and have not been outdoors long, will let you slowly approach and pick them up or entrap them. 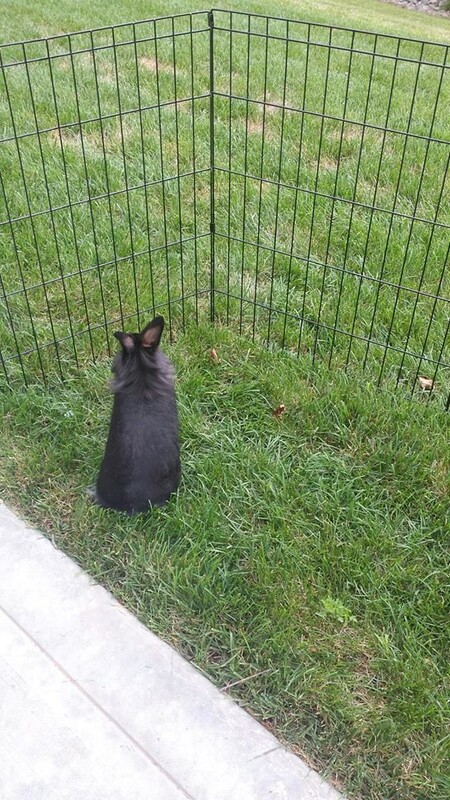 Other rabbits may only let you get within about 10 feet before they will run off. It’s important to know how skittish the rabbit that you’ve found is so that you can figure out the best approach to catching it. If the rabbit appears trustworthy and allows you to get within a couple feet, then you can try tossing a large box or laundry basket over them. If the rabbit is very cautious and won’t allow you to get close enough, then try one of the methods below. Most importantly, be patient! A rabbit will be easier to catch once it begins to trust you and associate you with food. Exercise pens may be purchased at various pet stores and online. These are what our volunteers use to catch abandoned rabbits. The more exercise pens the better, and if you are able to gather a few extra helping hands, then it will definitely make your job easier. You can try encircling the rabbit using the exercise pens. This works best when they are cornered or hiding under an object. 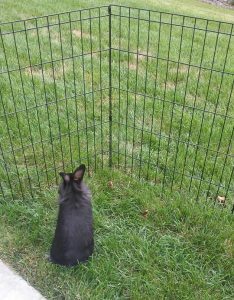 Your other option is to set up the exercise pen(s) in a half circle at least 10 feet from the rabbit and attempt to coax them from the opposite side into the enclosure. Once they are safely inside, work quickly to fully close the gap. Live traps are often unsuccessful and should only be used if they will be checked at least twice daily (morning and evening). More times than not our volunteers catch other animals, such as opossums and raccoons, instead of the rabbit they were attempting to rescue. Please be willing and able to safely release any wildlife that may become trapped if you are going to proceed with this method. 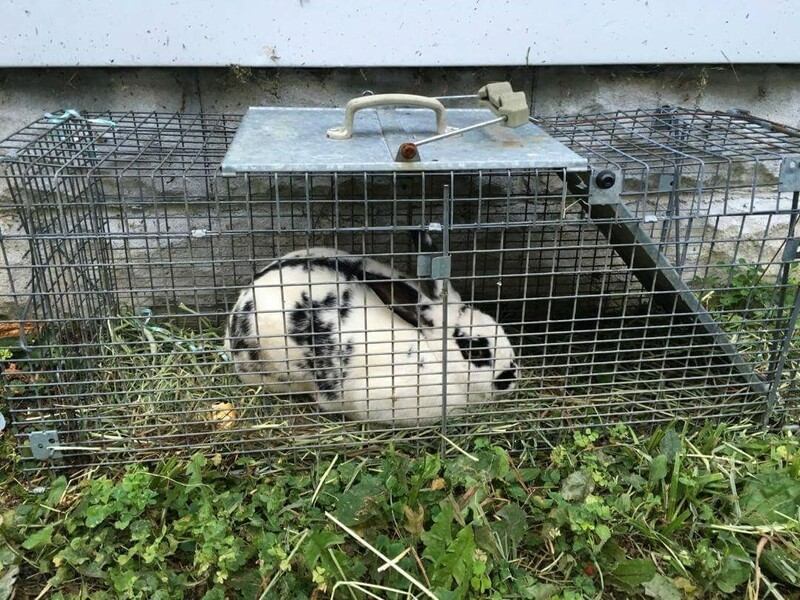 When setting up a live trap to catch a domestic rabbit, try to place the trap in the shade if possible and out of plain sight. Line the bottom of the trap with hay, lettuce, and treats to lure them. In case you’re successful, you will want to have a place to temporarily contain the rabbit. The easiest thing to have on hand is a pet carrier or crate. Just make sure the bottom is lined with newspaper or an old towel to prevent the rescued rabbit from slipping. 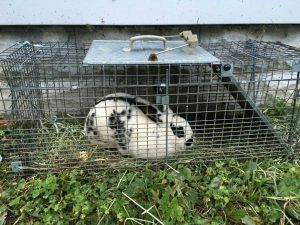 Contact your local rabbit rescue or Humane Society about your recent capture. They should be able to provide recommendations in terms of care until they are able to work out a date and time for the surrender of the rabbit. Note: Occasionally, multiple rabbits of opposite genders may be abandoned at once or a nest of domestic babies may be found. These situations are more difficult and should be handled with extreme care. Remember, babies cannot survive without their mother and should never be rescued without their mom.